Searching through their collections of the Chicago Field Museum (formerly the Field Museum of Natural History) revealed some paddles that have been part of their previous displays. Among them is a model associated with the Odawa (Ottawa) tribe acquired in Ontario for display in the World's Columbian Exposition of 1893. Here is a cropped pic of the paddle which features a straight sided blade shape and a small elongated grip. The blade end has been decorated with paint while the upper portion features geometric etchings not unlike the Odawa paddle at the Logan Museum of Anthropology. 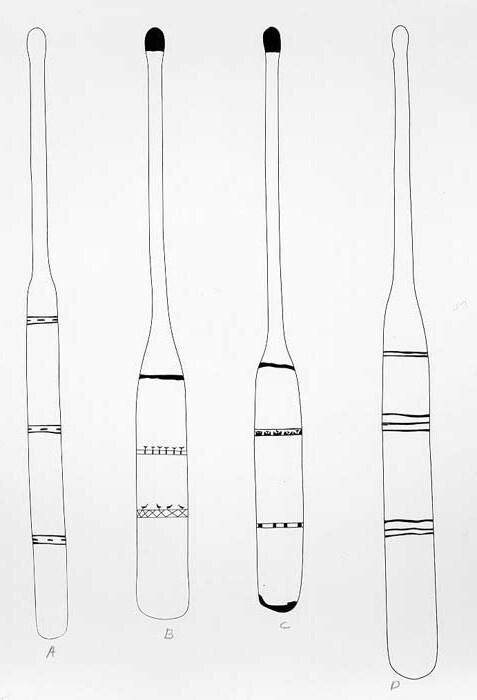 This previous post discussed the paddle forms documented by William D. Strong during his research of the Naskapi Cree (Innu) culture in 1927-1928. James VanStone's publication, Material culture of the Davis Inlet and Barren Ground Naskapi: The William Duncan Strong Collection outlines many of the ethnographic items collected during this expedition. Unfortunately when it came to full sized paddles, no photos were taken but instead, Plate 49 (pg 89) featured a hand sketched diagram of 4 decorated pieces acquired for the collection. The model looks to be similar to Paddle A from the display. "Strong's informants, on the other hand, denied any design symbolism or any relationship of the decorative motifs on their clothing and other objects to dream experiences. Rather, such designs as occur on moccasins, clothing borders, head-bands, and cartridge cases were purely decorative. Strong noted that design symbolism was not denied categorically but, nevertheless, in detail and with certainty. While believing it possible that people no longer remembered the meaning and significance of such symbols, he also was aware that in general his informants were evasive concerning most matters relating to religion. For example, he was certain that although the red and blue designs on men's snowshoes served primarily as identification marks, they also had magical significance. Informants confirmed that the markings brought good luck in traveling and hunting, but the ethnographer could obtain no interpretation for the meaning of particular designs"